After trekking for a few weeks it's time to relax. So I'm taking the time to explore Pokhara and it's surroundings. 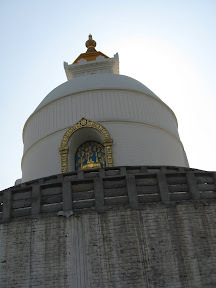 I went with a friend to the world peace pagoda (or stupa , as they call it here). This stupa was built by Buddhist monks in order to promote world peace. We combined 2 activities in one and started our visit with sailing in Pokhara's lake. We took a rowing boat from the lakeside area. The aim was to row the stupa's bank and from the to climb up to the stupa. Renting a boat costs around 350 rupees for 4 hours. 4 hours would be enough time for you to row one way, climb to the stupa, going down the hill and row back. rowing to the stupa's bank would take 30-60 minutes. It's not an easy task as it seems. If you don't feel like working hard, (or if you are not to many people on your group), hire a driver too. That will cost an extra 50 rupees. going down is easier of course, takes around 30 minutes. the problems was we had to row back, and we didn't really feel like after that mini trek. A different option for a visit at the stupa would be, taking a boat with a driver from the lake side bank. Rent the boat just for an hour, since you won't need it on the way back. The driver would take it back. 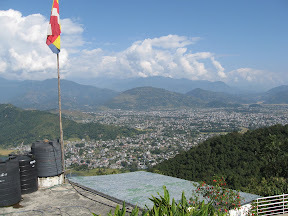 Climb the hill and later take the trail leading to the main road of the lake side in Pokhara. I haven't done it but talked to people who said it's pretty straight forward, so don't worry about this. please if there is someone who can help me on this particular topic then i will be thankful for him/her. i want to know about the climate and wind flow of pokhra and also want some good pictures of the city and most important thing is that i would like to have some pictures of tourist place like binyabasni mandir, mahendra gufa, davi's fall, phewa tal, barahi temple, seti gandaki, purano bazar, annapurana range, annapurana museum, begnas lake, rupa lake, etc..
Sonu, i'm working on a galery now for the website. many of the places yuo have mentioned, I have photos of….. There are some companies in Pokhara doing paragliding for tourists, they can give you all the info you need about climate and winds in pokhara. I saw some of thier graphs when I did my paraglying over the annapurna range 3 monthes ago, it was amazing! I remember that it was painted when I visited there a year ago. I'd be happy to get the new photo.